Our newest documentary, Stand for the Truth, is now available on DVD. In the six months since its online release, it has proven to be powerfully effective at reaching people who are new to the evidence or have long been on the fence. “Mind blowing.” “Deeply moving.” “A damning expose of corruption.” These are just a few of the things we’ve heard from the 500,000 people who’ve watched it. Now it’s available as a DVD. Surely, we won’t reach the same number of people who’ve seen it online. 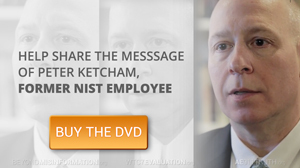 But the DVD is all about making a high-impact impression — that is, sharing Peter Ketcham’s story with someone who really needs to hear it. Whether that’s your partner, your children, your coworker or professors, journalists, and politicians, this DVD will help you get through to them like no other. 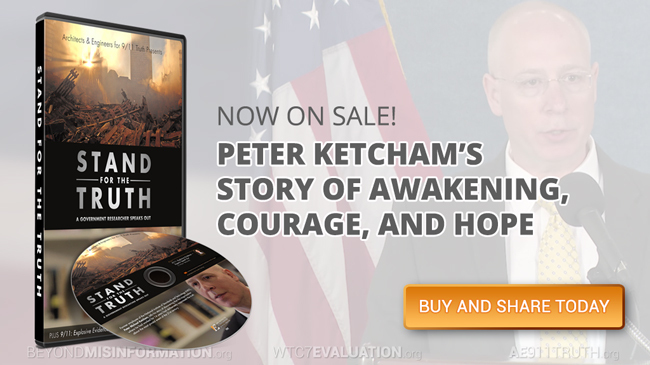 In addition to the poignant half-hour interview with Peter Ketcham, it features the one-hour version of our signature documentary, 9/11: Explosive Evidence — Experts Speak Out. There simply isn’t a more potent pill out there for waking up our fellow citizens to the truth about the World Trade Center destruction. Not to mention, when you buy this DVD you’ll be supporting the continued work of AE911Truth. So please visit our store today and buy one or more copies to share with the people you want to educate the most. Also, if you’re a member of AE911Truth, you’ll receive a 50% discount when you order two or more copies. Email us at membership@AE911Truth.org for the discount code or if you have a question about your membership status. Not a member and want to be? Become one today! 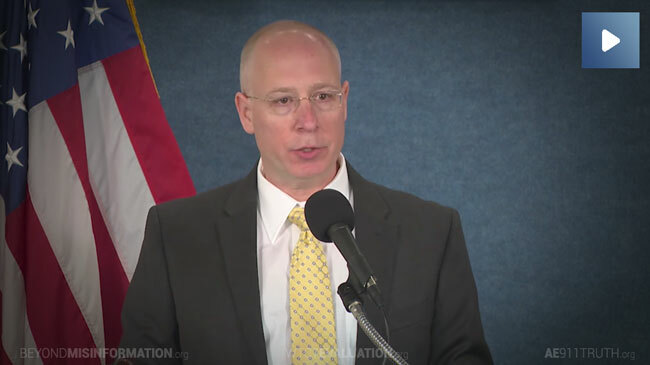 In case you missed Peter Ketcham’s spirited speech at the National Press Club this past September 11th, we invite you to watch it now.